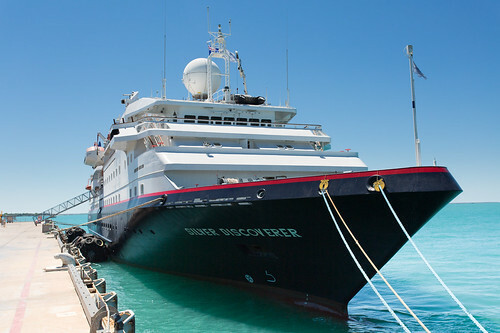 Silversea's inaugural sailing of Silver Discoverer. Silver Discoverer, Silversea's latest addition to its award-winning Expedition Fleet, welcomes her first guests today, exactly 20 years to the day since the company launched its first ultra-luxury cruise ship. Setting sail at 4:30 p.m. on her inaugural voyage from the port city of Broome, in northern Western Australia, the 120-guest, all-suite expedition ship will spend 10 days exploring the Kimberley Coast's staggering landscapes and ancient human history. A vast, rugged region, the Kimberley is home to towering waterfalls, wildlife-rich wetlands, and fascinating Aboriginal rock art painted over 20,000 years ago. This remarkable maiden journey concludes in Darwin, following a visit to Indonesia's Leti Island. 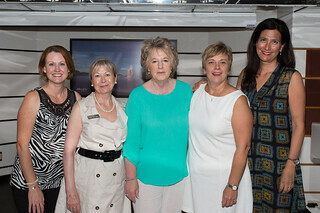 Christensen, Silversea; Jo-Anne Francis, Global Travel Solutions. "We're delighted that Silver Discoverer is embarking on her inaugural voyage on the very day that marks Silversea's 20th anniversary," said Karen Christensen Silversea's General Manager & Director Sales/Marketing, Australasia. "Over the past 20 years, our company has developed a reputation for exploring exotic locales - the kinds of places that most travellers can only dream about. It seems only fitting that this latest addition to our fleet will be sailing to what are arguably some of the world's most remote, most pristine, and least explored regions." Silver Discoverer's inaugural season will encompass many of the Pacific Ocean's most isolated corners. In addition to several Kimberley Coast voyages, there will be visits to wild and infrequently travelled lands in Southeast Asia, Micronesia, Melanesia, East Asia, the Russian Far East, New Zealand, and the Sub-Antarctic Islands. In 2015, Polynesia will join the schedule, in addition to a number of other exciting new Pacific destinations, such as the remote Phoenix Islands Protected Area in Kiribati, which includes Nikumaroro, the island some believe to be the final resting place of famed aviator Amelia Earhart. These exhilarating expedition cruises offer adventure travellers rare opportunities to discover unique cultures, such as the Māori people of New Zealand, with their rich history and timeless traditions; snorkel, dive and admire the incredible ocean habitats in Raja Ampat, considered to be the heart of the world's coral reef biodiversity; witness spectacular natural landscapes, including the massive volcanoes of the Alaska Peninsula or, during an inclusive flight, the breathtaking Bungle Bungle mountain range in Purnulul National Park. Silver Discoverer offers a comfortable, intimate and convivial onboard lifestyle where guests can feel at home as they explore secluded realms. Guests will enjoy ocean-view suites, gourmet cuisine, the personalised service of a butler, and a generous selection of all-inclusive onboard amenities, including complimentary beverages, wines and spirits served throughout the ship, and stocked in-suite beverage cabinet. In true Silversea Expeditions style, guests will be enriched by an onboard program of destination lectures, photo presentations and daily recaps. Exploratory Zodiac excursions and interactive walks ashore, led by experts in their field, including marine biologists, ornithologists, geologists, botanists, historians, and anthropologists, are complimentary.